(Lancaster, Pa., Dec. 18, 2018) – The Atlantic League of Professional Baseball (ALPB) today announced it has adopted the extra-inning tiebreaker rule currently in effect in all affiliated professional baseball leagues. 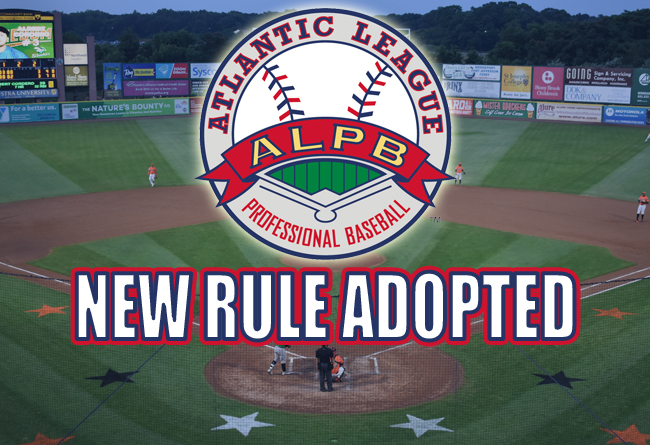 The rule was unanimously approved by the Atlantic League Board of Directors. Among the considerations of the ALPB Board was the number of ALPB players who move to Major League Baseball organizations every year. “With dozens of players transferred from the Atlantic League to MLB organizations annually, we felt it was critical to place them in similar circumstances to what they would encounter as a member of an affiliated club,” said White. Extra innings will begin with a runner on second base. The runner at second base will be the player in the batting order position previous to the leadoff batter of the inning (or a substitute for that player). By way of example, if the number five hitter in the batting order is due to lead off the 10th inning, the number four player in the batting order (or a pinch-runner for such player) shall begin the inning on second base. Any runner or batter removed from the game for a substitute shall be ineligible to return to the game, as is the case in all circumstances under the Official Baseball Rules. For purposes of calculating earned runs under Rule 9.16, the runner who begins an inning on second base pursuant to this rule shall be deemed to be a runner who has reached second base because of a fielding error, but no error shall be charged to the opposing team or to any player. Additionally, the runner who begins an inning on second base would earn a run scored in his statistics should he cross home plate safely in that inning. The extra-inning tiebreaker rule shall only apply to games played during the Atlantic League’s 140-game regular season. All postseason games will be exempt from this rule and will be played without runners automatically placed on the basepaths until a winner is determined.